Just two of the five U9 boys (and one U8!) 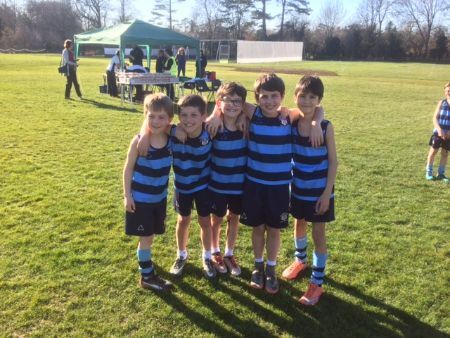 competed at Hilden Grange last year, but the fast, flat, short course (just under 1km) provided a low-key, unintimidating introduction to competitive running for Josh B, Felix G, Max Y and Edward S who joined the team this year. Run around a school field and the local cricket ground, the Hilden Grange Trophy is contested by prep and primary schools in the Tonbridge and Sevenoaks area and the competitive spirit amongst boys at that age is strong! The field raced away from the start line as if they were running the 60m sprint; 900m is a long way to sprint, and little legs soon tired, making it a battle of determination. Oli H showed plenty of this as he led his team home in 13th place. There was some confusion as to where Louis A came, as he ducked under the tunnel-rope to present himself to Mr Fox before receiving his ‘ticket’. However, he was awarded 20th, with Edward S, running ‘up’ an age-group next to cross the line in 33rd. Felix G (41st) completed the four-to-score team, just out-pacing Max Y (45th) on the run for home. And we were so proud of Josh B, in his first race for the school, for completing the course, with a smile, in 60th. The team finished sixth of eleven. A good effort.